At 6:15 a.m. band, orchestra, and choir filed onto a bus at Central high and departed to Junction City for this years district auditions. 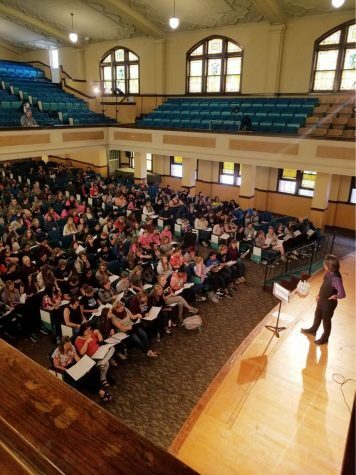 Sophomore Gabby Fischer had been vigorously practicing her auditions piece for the past seven months. 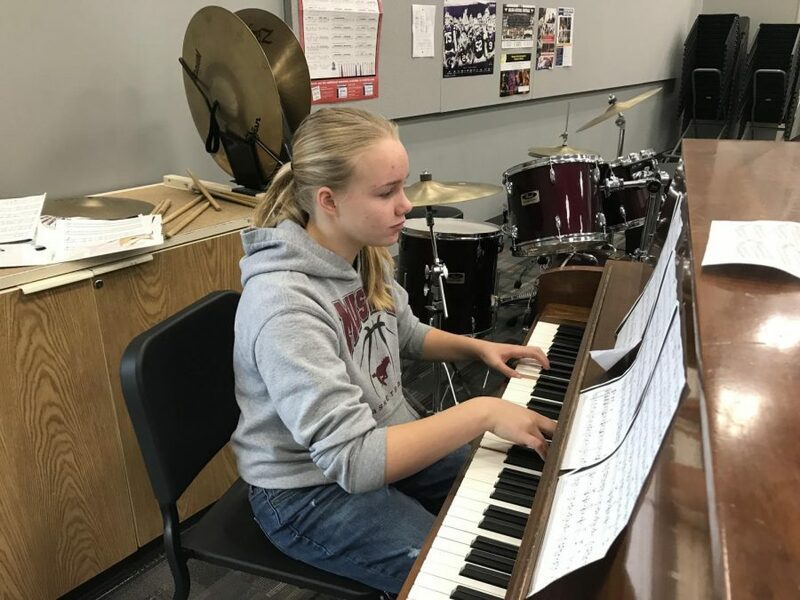 Freshman Olivia Moore, auditioning on jazz piano, had to practice a lot as well. 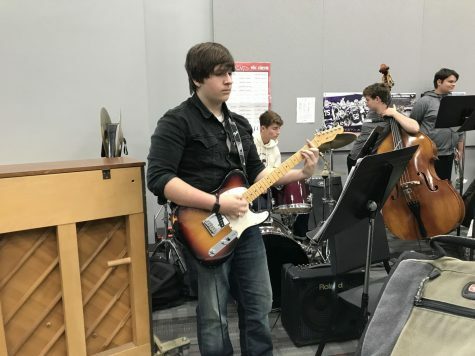 “It took me awhile to get all my music down and then it was pretty hard to get all chords and knowing all of it and getting all the rhythms at the right tempo, and I just practiced.” Moore said. When the students got to Junction City High tensions were running high. The staff try to make the environment very welcoming and very stress free since they know that the students are already nervous. The auditions were blind auditions, which means the judges and the students auditioning were separated by a curtain. This made the audition process a little less stressful. 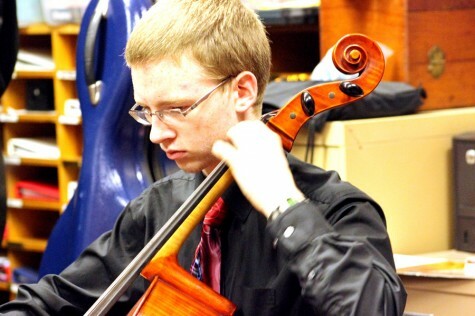 The roster was posted Tuesday evening and many Salina Central’s musicians have made into the district orchestra, choir, band, and/or jazz band. Band- Raquel Fuentes-Fritz (clarinet), Gabby Fischer (alto saxophone), Emery Newton (trombone), Andrew Goltl (trombone-alternate). Jazz Band- Gabby Fischer (alto saxophone-alternate), Jon French (tenor saxophone), Aaron Moreno (tenor saxophone), Raquel Fuentes-Fritz (bari saxophone-alternate), Emma Tieking (trumpet), Tyler Corl (trombone), Cristian Santos (trombone), Jose Arrieta-Renteria (bass trombone), Cameron Anaya (trombone-alternate), Olivia Moore (piano-alternate), Mason Soukup (bass), Josh Rubino (drums). Orchestra- Alora Nesting (violin 1), Hannah Pipp (violin 1), William Phachanla (violin 1), Elizabeth Collins (violin 1) , Donnie Johnson (violin 2), Jonathan Hess (viola), Meg Duckworth (viola), Katie Janzen (viola), Lauren Tubal (viola), Sophie Craft (cello-alternate), Sh’Kaiya Hutchens (bass), Auston Rageth (bass). Choir- Moses Brown, Gage Burmaster, Douglass Chance, Payden Cox, Grace Demaree, Lane Griffin, Indigo Guise, Aaron Hawley, Will Hayes, Noah Highsmith, Bradyn Houltberg, Kerrigan Hutton, Isaac Johnson, Lanaisha Johnson, Isaac Morris, Madeline Paradis, Aamir Sandhu, Maddie Stack, Annie Taggart, Saria Taylor, Nate Weis, Gavin Wolfmule, Kaleb Wood, Kenslie Arnold, Areanna Heysquierdo, Carly Redding.